Left: axons (green, pink, blue) form organized patterns in the normal developing mouse spinal cord. Right: removing netrin1 results in highly disorganized axon growth. It’s time to rewrite the textbooks. 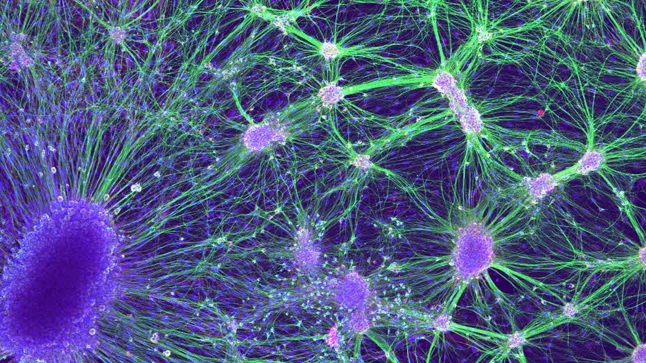 A new study from Samantha Butler of the Eli and Edythe Broad Center of Regenerative Medicine and Stem Cell Research at UCLA has overturned long-standing theory about how our nervous systems develop. Butler’s findings could lead to new medical treatments that help nerves regrow and reconnect – whether they’ve been severed by injury or damaged by the neuropathy that can occur in diabetes and other diseases. 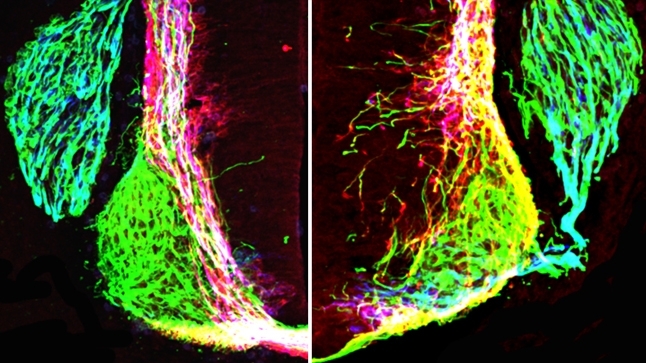 As the nervous system forms during embryonic development, axons—threadlike projections that connect nerve cells—extend into the developing spinal cord. A special protein, called netrin1, was long thought to help axons find their way during development, in much the same way that a lighthouse guides a ship – by sending out a signal to orient it from afar. For decades, this explanation for how axons grow has been taught to neurobiology students across the globe. Through years of research, Butler and her team found that netrin1 encourages axon growth in a rather different way. She has discovered that axons grow by following a pathway of netrin1 produced by stem cells in the nervous system. This pathway directs axons in their local environment, meaning the relationship between netrin1 and axons is more like that of a lattice and ivy – netrin1 guides axons by providing a pathway for them to stick to and grow on. “Certain stem cells in the nervous system have an intrinsic capacity to lay down this growth path,” explained Butler, an associate professor of neurobiology in the David Geffen School of Medicine at UCLA. “These are huge effects. Netrin is a very powerful molecule that bundles and directs axon growth.” Butler published these findings recently in the journal Neuron. This research has implications far beyond academia. 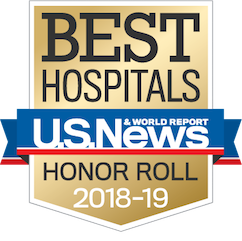 With this discovery, researchers could develop new strategies using netrin1 to enhance the body’s natural nerve repair process. Scientists are already exploring some promising approaches to nerve regeneration, such as artificially reproducing nerve channels, which are protective rings of tissue in which nerves grow. But a faster method is still desperately needed. While damaged or severed nerves do have the capability to repair themselves, the process can be slow and painful -- as wounded combat veterans know all too well. Furthermore, if muscles go too long without the stimulation of a nerve connection, a connection ultimately can become impossible, which could lead to amputation of a limb. In order for nerve regeneration to be successful, it must be quick – and netrin1 may be the secret to putting this process into overdrive. Butler hopes the answer to this question is yes. If netrin1 can be used to successfully manipulate nerve growth, her discovery will not only changes textbooks, it would change nerve damage treatment options for millions of people worldwide.